A tractor-trailer hauling Takata air bag propellants exploded on a Texas highway last week. The explosion was so big it engulfed a passing vehicle, killed a woman in a nearby home and injured four people including the drivers and passengers of both vehicles. While the official cause of the incident has not been determined, it is said that the truck driver failed to negotiate a curve and crashed, igniting the explosion. 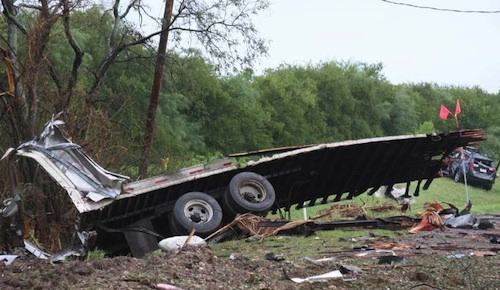 The tragic explosion occurred in the early morning hours on August 22 at around 2:15 a.m. on U.S. 277 near Quemado, TX. The trailer-truck was hauling air bag propellants carrying air bag detonators and blasting agents to Takata’s storage facility in Eagle Pass and was being operated by a subcontractor’s driver. According to authorities, the driver lost control of the vehicle on a curve and crashed. 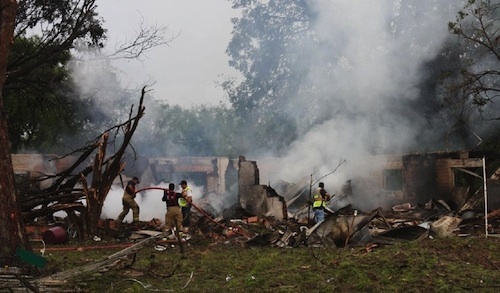 The Texas Department of Public Safety said the fiery explosion was massive enough to engulf a passing car in flames and reach a nearby home, killing 67-year-old Lucila Robles who was sleeping inside. Maverick County SheriffTom Schmerber said that the department had led a difficult two-day search for Ms. Robles, which ended when family members found her remains. The explosion also caused multiple fires, damaging 10 nearby houses and debris was found as far as 2 miles from the site. The truck driver and a passenger, along with the driver and a passenger in the passing vehicle, were all injured in the explosion and taken to a nearby hospital. Jared Levy, a spokesperson from Takata Corp. told media that the truck had been carrying ammonium nitrate, which is the explosive chemical used in several types of airbag inflators. He also said the company is working with authorities in investigating the crash and explosion.“ Takata has strict safety procedures relating to the transportation of its products that meet or exceed all regulatory requirements. Our thoughts are with the family of the woman who died as a result of this accident, and with the four people injured,” said Levy. The company is already is in the midst of the biggest automotive recall in U.S. history for faulty airbags being linked to 11 deaths and over 100 injuries worldwide. I use to run a dedicated lane from Eagle Pass, TX to Columbus, OH hauling the airbags, never had issues with them even in the 115*F weather! It was even more hot in the trailer, at times reaching 150*F. I drove that lane for 3 yrs and ran my last run for them in April then switched to a different company! Never really knew what type of damage it would result in if the airbags had ever malfunctioned/detonated in the trailer! Very scary to now reflect on that after reading this! Prayers for all involved! This really has nothing to do with company who makes airbags. Guy lost controle he was carrying explosive goods. Then big bang. Very bad that someone died. Seriously? You don't even know what your talking about. Really would they have blamed the munitions company if he had been carrying munitions. Or any other deadly hazmat for that matter. If he hadn't gone off the road it wouldnt have exploded. I thought the same thing. Takata had nothing to do with the wreck if everything was packaged and loaded properly. Bad deal either way. If a airbag malfunction it do that. Even if an airbag explodes (worse case for airbags) VERY loud boom then loss of air and you pull over, you still got time to react to it...and not lose control from freaking out and over correcting. If just one air bag blew (unlikely even at max weight that more than one at the same time would blow) you MIGHT have a load shift, depending on the load and the securement job done. Doubtful that a faulty air bag caused this, even more doubtful that an airbag had an extreme fault (like exploding). I've witnessed 2 blow at the same time on a dump truck before...only time I've ever heard of such a thing happening...caused by Jerry rigging the leveler at an incorrect level causing them to overfill, 30 minutes later (if that), B BOOM. Scary sounding but there are 3 others all next to each other that will support the weight long enough to pull over without being damaged IF one of them explodes like that for whatever reason. Funny how some people reading this have the mindset it is about the trailer/vehicle airbags that blew. The guy was carry a load of material that MAKES airbags for autos,and those chemicals exploded. Yeah after the driver fucked up !!! Prayers to everyone involved & prayers to the family of the deceased. 🙏🏻🙏🏻🙏🏻🙏🏻🙏🏻🙏🏻. Sorry for your loss. Tiffany Booher Jahron Buddenbohn glad I didn't experience this hauling the airbags for Takata! Sad thing is that Takata has a monopoly on airbag production. They need to take airbags out of cars. They are not safe, or as affective as they lead you to believe. Dang what a freak accident! We were just discussing these on a group I belong to!! !